Do you dare to pair? 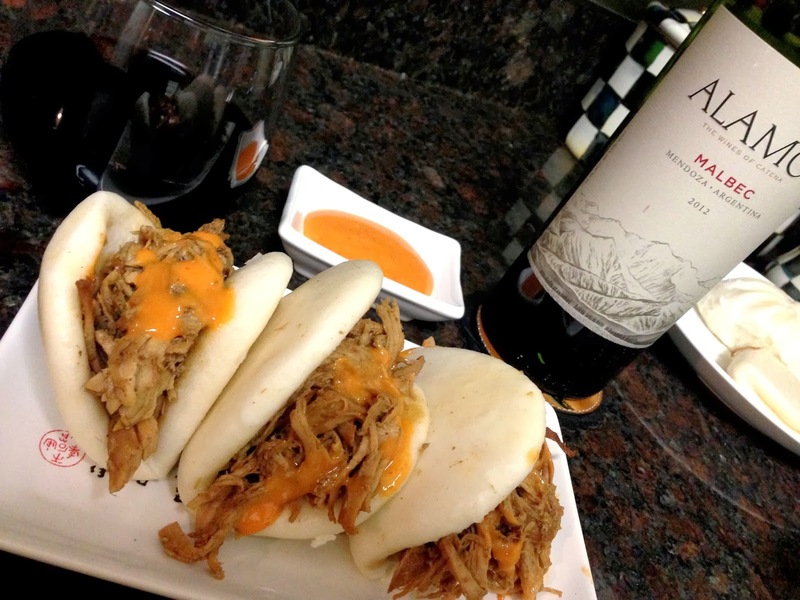 I was given a challenge to pair a bottle of Alamos Malbec with an adventurous recipe. One of my absolute favorite things to eat is "stinky buns". This isn't the correct term for this delicious pillow filled with savory and spicy meats but it is how I learned to know it from a food truck in Tampa a few years ago. A few years later, I was reintroduced to a new kind of bun - at Epcot Food and Wine Festival - the Mongolian Beef Bun in China's pavilion. I luckily live close to an Ethnic market which carries everything needed for this recipe - including the steamed buns. So - I guess I cheated using previously made buns but I am an awful baker and these turned out perfect. Now the frozen steamed buns are a staple in our freezer. This recipe turned out better than I could have expected and the Alamos Malbec was a perfect companion. Combine all ingredients except beef broth and cornstarch in your slow cooker pot and place in the refrigerator - marinating overnight. The following morning, remove from fridge and turn slow cooker on low for 8-10 hours. Without removing any of the juices, remove pork from slow cooker and wrap in alluminum foil. Meanwhile, combine beef broth and cornstarch in the liquid marinade, turn slow cooker on high. Bring to a boil and add pork to the mixture. Shred with two forks. Here is the brand I found in my local ethnic market. I used a steamer pot for 15 minutes and they came out perfect. I couldn't tell you what the brand is called but see below for what to look for. Make sure you use parchment paper to prevent from sticking to the steamer basket. Very nice!! I love stinky bunz from Anise! That's the next lunch adventure for sure!